Today, live from London, Coca-Cola and Maroon 5 are tapping into their respective fan bases to build an original song, from start to finish, in 24 hours. Fans are getting access to the "recording studio" by visiting www.coca-cola.com/music, where they can interact with the band and lend their creative inspiration to lyrics, riffs and rhythms for the new song. Coca-Cola is calling it the "biggest experiment in rock history." "Coca-Cola has a long history of using the power of music to bring people together from around the world in the most relevant and compelling ways," said Joe Belliotti, Director of Global Entertainment Marketing, The Coca-Cola Company. "We are excited to be working with Maroon 5. They have a huge global following and a strong track record of producing great music. They have worked closely with us to help shape the event and ensure the session will be a fun and engaging experience for fans no matter where in the world they are." 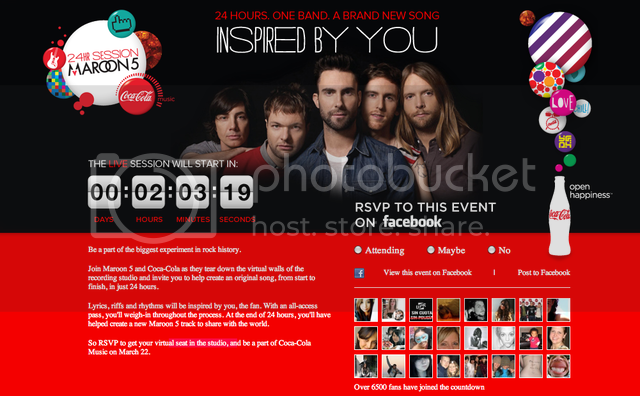 The 24hr Session is part of "Coca-Cola Music," a new music program from Coca-Cola aimed at teens throughout the world. Coca-Cola is activating the program using the brand's social networks including the over 20 million consumers on the Coca-Cola Facebook page and the @CocaCola Twitter account, which is providing updates. Also helping to spread the word and encourage participation, bloggers from nearly 20 countries will be onsite to keep their followers informed and involved in the process. "This is the most ambitious and experimental effort in music Coca-Cola has ever undertaken. For the 24hr Session, we are deploying and developing new and emerging technologies to allow as many people as possible to be part of the event and gain insight into the creative process that goes into making great music," Belliotti continued. During the 24 hours, fans are being asked to send in words, pictures and comments to inspire the creation of the song and will have a chance to ask questions and vote for different options put to them by the band. Adam Levine of Maroon 5 comments, "The band all remembers when we were younger and making music in our bedrooms, trying to imitate our heroes. To be part of something global like this that gives an insight into what happens behind closed doors is really exciting. We're looking forward to being part of the 'Coca-Cola Music' 24hr session and welcoming the world into our creative process."